CHILDREN: He has one grown son, Peter, with his late wife. 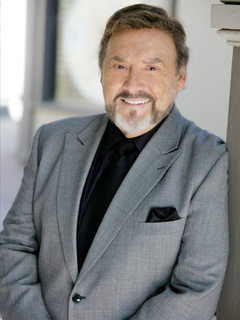 Joseph Mascolo was born and raised in West Hartford, CT. From early on, his passion was for classical music and opera. He hadn’t considered acting until a music scholarship brought him to the University of Miami, where a drama coach realized he was destined to be on stage. Mascolo played the clarinet for the Metropolitan Opera Orchestra while studying acting. His first off-Broadway role was the production of The Threepenny Opera, followed by an appearance in A View From the Bridge. He made his broadway debut in Dinner at Eight. In 1982, the head writer for DAYS OF OUR LIVES wrote the role of Stefano DiMera for Mascolo after noticing him in his television appearance in THE GANGSTER CHRONICLES. He remained on the show for 18 years, earning him the Digest Award for Outstanding Villain in 1997. He played Massimo Marone on BOLD AND BEAUTIFUL for five years, and then returned to Salem to lead a rejuvenated DiMera clan on DAYS in 2007. Played clarinet in the band at West Point for three years because he never made it as a cadet; later played clarinet for the Metropolitan Opera Orchestra. Studied acting under legendary teacher Stella Adler. Succeeded Robert Duvall as Eddie Carbone in A View from the Bridge, and joined an ensemble that included co-star Jon Voight and assistant director Dustin Hoffman. When not on the set, Mascolo is overseeing the completion of the dream home he designed in Lake Arrowhead. Sang a duet with Luciano Pavarotti in the film, Yes Giorgio!. Flashback Friday - Joseph Mascolo's First Interview With Digest! Peter Reckell (ex-Bo), Joseph Mascolo (ex-Stefano) and Andrew Masset (ex-Larry) back!